"A quick, cool, tasty treat, perfect for a hot summer day!" 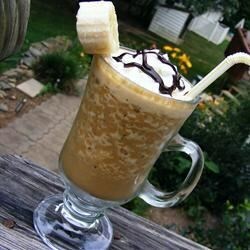 In a blender, combine banana, chocolate syrup, milk and crushed ice. Blend until smooth. Pour into glasses and serve. I used chocolate soy milk instead of regular milk...very good! Was good but not great. I would suggest more bananas and some kind of sweetener. I also used Nesquick b/c I like it better than chocolate syrup. Really easy and tasted really good! Great taste, and an even better way to get kids to drink something good for them. A little bland, but then again I like sweet drinks. Next time i will add some sugar. Really yummy. I did add a little extra choc syrup, and I used 2 small bananas. Will definitely be making this again.